Tropical Storm Nate is now back over the warm water of the northwest Caribbean Sea, poised for a strike on Cancún and Cozumel tonight, then on the northern Gulf Coast Saturday night and Sunday, where hurricane watches have been posted. 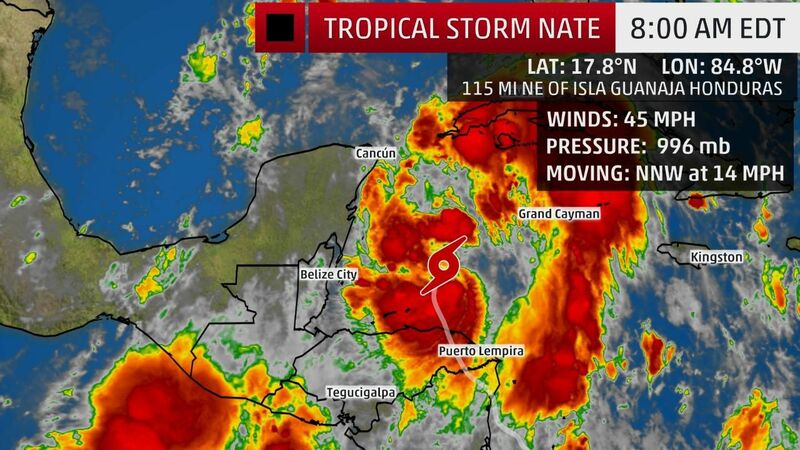 Nate's center is currently about 230 miles south-southeast of Cozumel, Mexico, moving north-northwest about 15 mph. Heavy rain continues to fall across parts of Central America and clusters of thunderstorms have also pushed well east and northeast of Nate's center toward the Cayman Islands and Cuba. Tropical storm force winds have expanded to reach up to 90 miles mainly to the east of the center. A hurricane watch and tropical storm warning have been issued for Mexico's Yucatan Peninsula from Punta Herrero to Rio Lagartos – including Cancún and Cozumel – meaning hurricane conditions are possible and tropical storm conditions are expected. Tropical storm warnings have also been issued for parts of the Caribbean coast of Honduras – from the Nicaragua/Honduras border to Punta Castilla, Honduras – meaning tropical storm conditions will continue for the next several hours. A hurricane watch is in effect for portions of the northern Gulf Coast in the U.S. from Morgan City, Louisiana to the Alabama/Mississippi border including the New Orleans metro area, Lake Pontchartrain and Lake Maurepas. This means hurricane conditions are possible, in this case within 36 to 48 hours. A storm surge watch has been issued portions of the northern Gulf Coast in the U.S. from Morgan City, Louisiana to the Alabama/Mississippi border including the northern and western shores of Lake Pontchartrain. This means there's a threat of life-threatening storm surge inundation associated with Nate. A tropical storm watch has been issued from the Mississippi/Alabama border eastward to the Okaloosa/Walton County line in Florida and from Morgan City, Louisiana westward to Intercoastal City, Louisiana. This means tropical storm conditions are possible, in this case within 36 to 48 hours. Environmental conditions are favorable for additional strengthening over the northwest Caribbean Sea. Water temperatures are currently in the mid- to upper 80s, about 2 to 5 degrees above average, and wind shear may lessen a bit. Nate will make its closest approach to Mexico's Yucatan Peninsula – including Cancún and Cozumel – tonight, as either a tropical storm or low-end hurricane. Bands of locally heavy rain will pick up during the day in the Yucatan Peninsula, making any last-minute preparations difficult. Tropical storm-force winds could arrive by evening, and surf will gradually build. A storm surge of 1 to 3 feet above normal tide levels is expected with the closest pass of the center of Nate tonight along the northeast Yucatan Peninsula. Parts of the Yucatan Peninsula could pick up 2 to 4 inches of rain, with isolated totals as high as 8 inches, leading to flash flooding through Saturday. Areas of locally heavy rain from a larger-scale "Central American gyre" (again, more on this feature below) are likely to persist at least into part of the weekend in parts of Central America and far southeast Mexico. This torrential rain may trigger dangerous flash flooding and mudslides, particularly over the mountainous terrain of Central America. Nate's center will make landfall along the northern Gulf Coast, between southeast Louisiana and the far western Florida panhandle, late Saturday night or early Sunday. This landfall will most likely be as either a low-end hurricane or strong tropical storm. There remains some typical uncertainty in both the exact track of the center and its intensity. Saturday night: Damaging, hurricane-force winds possible in hurricane watch areas; landfall expected overnight with storm surge flooding in surge flood watch areas and bands of heavy rain; worst of the impacts likely to the north and east of the center track. Sunday morning: Again, landfall could occur in pre-dawn hours with storm surge flooding, hurricane or tropical storm-force winds near and east of the center; areas of heavy rain spread into other parts of the Southeast. Sunday afternoon/night: Nate weakens over the Tennessee Valley with some lingering gusty winds but heavy, potentially flooding rain spreading into the Appalachians. Monday: Lingering heavy rain, flash flooding possible in the Appalachians and parts of the Northeast. To emphasize, preparations should be completed, if possible, by Friday in the hurricane watch area, as conditions (outer rainbands, some at least minor coastal flooding at high tide) will go downhill already on Saturday. A swath of 3 to 5 inches of rain, with locally higher amounts, is expected not just near the landfall area along the Gulf Coast this weekend, but also well inland through Monday into the Tennessee Valley and Appalachians. This may trigger serious inland flash flooding Sunday into Monday in the Appalachians, as happens often with inland tropical cyclones. Other parts of the Ohio Valley and Northeast may also see some heavy rain, depending on the path of Nate's inland remnant. This latest tropical system originated on the eastern end of a larger feature, called a Central American gyre. Enough spin and thunderstorm activity was collected east of Nicaragua on Oct. 4 that the National Hurricane Center upgraded Invest 90L to a tropical depression. Heavy rain partially from the gyre and from newly upgraded Tropical Depression 16 spread across Central America. According to the National Hurricane Center, Nate was upgraded from a tropical depression on the morning of Oct. 5 based on radar from San Andrés, an island east of Nicaragua, indicating a partial eyewall and a surface pressure measurement over Nicaragua found to be lower than previous advisories. Nate moved ashore over northeastern Nicaragua later that day. This "gyre" is a large, broad area of low pressure over the Central American isthmus and western Caribbean Sea. This feature can lead to the development of a tropical cyclone in the Caribbean Sea and/or in the eastern Pacific Ocean. These gyres most often form in the late spring and early fall, when cold fronts become uncommon in this region of the world. They're most common in September, but can be a source of tropical storms and hurricanes into November, and as early as May. We typically see up to two gyres like this one set up each year, and they can spawn tropical storms in both the Atlantic and eastern Pacific basins, sometimes in each basin at the same time. Not all gyres produce tropical cyclones, but they all produce heavy rainfall. Roughly 50 percent of Central American gyres have a tropical cyclone associated with them, according to Philippe Papin, Ph.D. candidate at the University of Albany. "When a tropical cyclone does occur, it tends to form on the eastern side of the [gyre] and rotates counterclockwise around the larger circulation." Gyre-like tropical systems are much more common in the western Pacific closer to southeast Asia, where the monsoon plays a larger role in the weather. A notable example of gyre-induced tropical cyclone formation occurred in 2010 when Tropical Storm Nicole formed just south of Cuba from the gyre in late September. Nicole was a short-lived and ill-formed tropical storm that tried to cross Cuba. It brought heavy rain to the Cayman Islands, Jamaica, Cuba and portions of South Florida. Hurricane Stan in 2005 is another good example of a hurricane's interaction with a Central American Gyre, according to Papin. Following Stan's dissipation over the mountains of central Mexico, its remnant spin became part of a larger gyre that caused heavy rainfall over Central America. While Stan's direct circulation resulted in around 80 deaths, according to the National Hurricane Center, heavy rainfall resulting from the gyre took more than 1,000 lives across Central America. Other examples include Tropical Storm Andrea (2013), Hurricane Ida (2009 – assist from the gyre) and Hurricane Patricia (2015 – assist from the gyre, not a direct result).